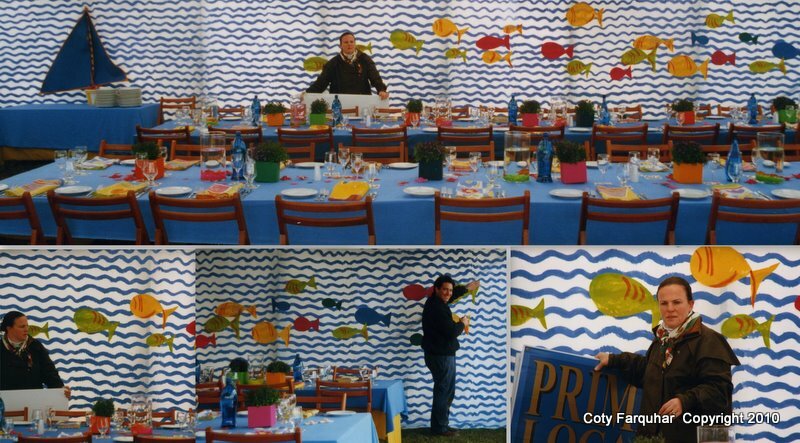 Today it is wet and cold here in Bowral and so was this event that I designed and styled for a television station here in Australia for a corporate lunch many years ago. Yes, a corporate lunch for 120 guest at the races. It was pouring with rain all week, I worked in gumboots each day as I delivered everything and set up the tent. But the only thing on my mind was the colours that I was working with. I was inspired by the colours of goldfish, star fish and all the fabulous colours of sea. I found really cheap bright blue bolts of fabric for the tables. I painted 20 metres of white sheeting fabric with blue swirly lines for the walls. Which believe me took forever. I made some rather crazy looking fish that I attached to the backdrops, which I should have asked five year old children to paint for me, they would have done a better job. But it was fun making them !!! I grabbed everything that I passed in shops that had bright colours, boxes, plants, coloured pebbles for the fish bowls (yes real little fish) and whilst hunting through a fabric shop I came across hundreds of colourful tea towels with the same sort of painted styles as my backdrops. I cut them all up in half and made napkins out of them. I even found some fantastic blue water bottles for the table. 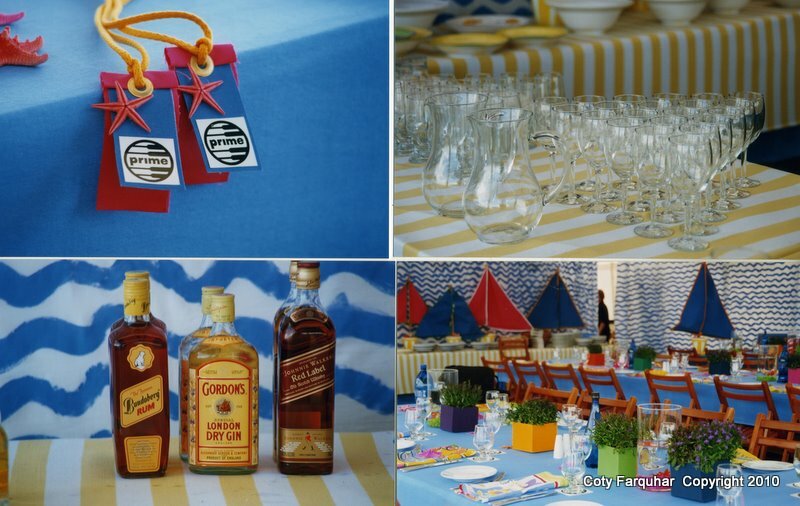 I bought twenty blue and white striped salad bowls as well for the food tables, which sat on my favourite yellow and white striped fabric. I only had a little roll of this fabric, just enough for some more colour. The food was fresh and also colourful. 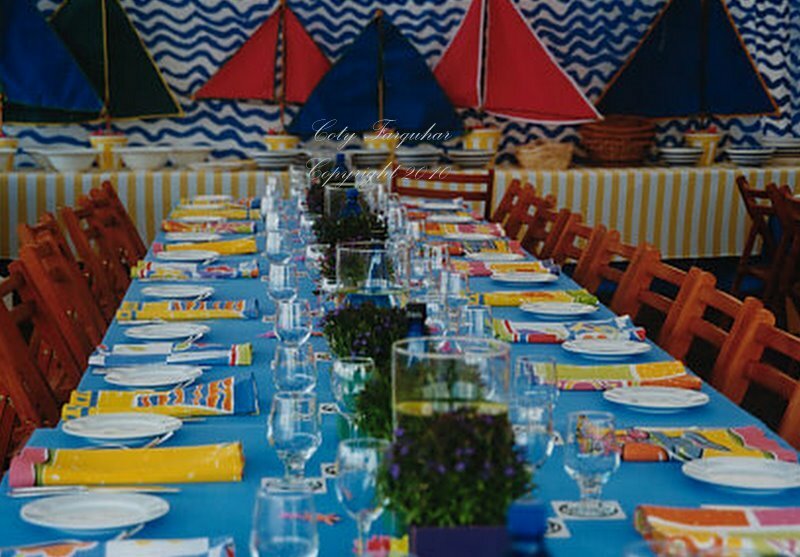 I sewed together some fantastic coloured calico into sails trimmed with colourful binding, secured them onto a timber dowel and had them standing in little yellow and white striped pots that I painted on the food table. From a distance, it looked like they were just sailing by. It was really simple, really easy and it really didn't cost that much to put together either. Anything is possible - Just have fun ... I hope I have inspired you to create your next party. and the people at the party were just as glamorous as these wonderful vintage illustrations. Below: Setting up and my Andrew never far away, the things I get him to do.!! Don't forget to visit Susan at Between Naps on the Porch for more table settings and all her wonderful guests that gather each week to share their settings. and for the first time I have joined Karin at Style Sisters for a new party 'Centrepiece Wednesday" come and visit, she has some 'great ideas"
Wow oh Wow this is amazing! The ideas! !..the colors!! The goldfish!! AMazing! I host a new link up party called Centerpiece Wednesdays and would love to have you link up with your amazing ideas, talent and fun! I have your button on my blog..I really appreciate all you do! p.s. meant to say I love the stripey blue bowls reminds me of a Englishy country look a bit in amongst all that colour! This post makes me smile, Coty! So colorful and playful. I am sure a great time was had by all attending!! Coty, I think you must work magic. I love the goldfish & the painted sheets, just brilliant! So pretty, very vibrant and colorful and energetic looking. I love the striped bowls, and the striped yellow and white fabric. A very fun setting which comtributed so much to make it a memorable event. 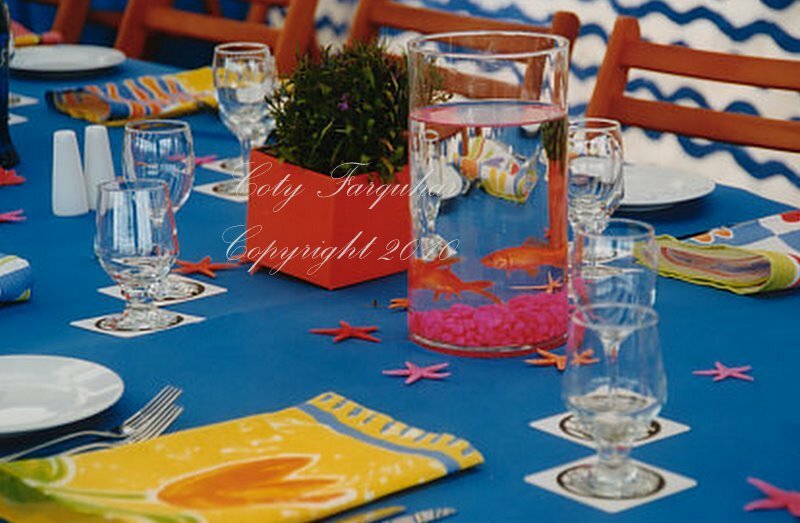 Coty, What a colorful dinner party, I love the painted fish and all your sailboats, just darling. Everything looks wonderful, you really are blessed with amazing talent! I can always count on you to bring us ansolutely fabulousness!!!!!!!! I can't help but think what a wonderful antidote this setting must have been considering the rain outside. I bet it ensured that the party was a huge success despite the downpour. The colours are just so cheerful and happy. God bless your Andrew....what a champion! Meredy xo. What a very vibrant and happy looking event. I am sure the people enjoyed the table as much as I do. 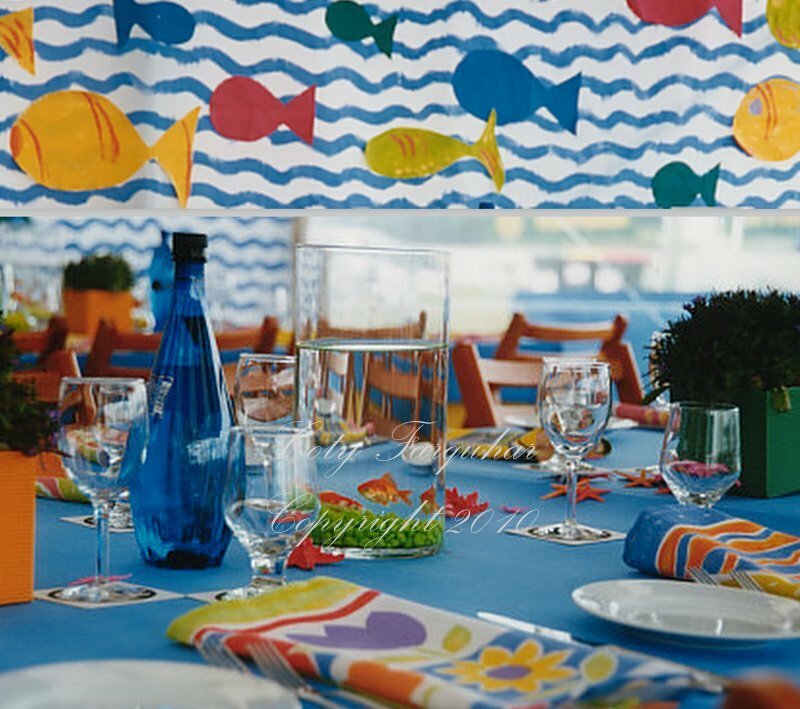 That table is awesome...I can't imagine painting all those water waves, then making all the fish, sailboats and napkins! 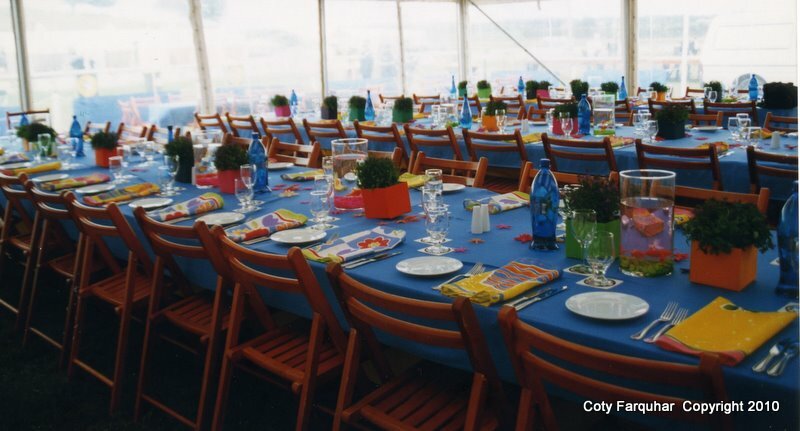 You chose such fun colors for these great luncheon tables. Thanks for sharing. The painted blue ocean wave backdrop was fantastic...all the colors no doubt made everyone forget about the weather!!! Love the colors in this--so bold and cheerful! Coty, your talent and creative energy seem absolutely limitless! What a bright, shining light in the world you are! This is so different from what you've usually shown us, but equally brilliant in terms of both concept and execution. Thank you, as always, for the inspiration! Just stopping by to say hello and send wishes for a lovely weekend. This party is just beautiful! After this comment, I am headed straight to the follow button. :) I look forward to getting updates on your blog. I hope you will check my blog out, as well!